I always thought that the D in D-Day stood for Deliverance, but I was wrong. In fact, the D represents Day, or the Day. Sadly, in the case of Operation Overlord, otherwise known as the Battle of Normandy, the D could also represent death, as there were thousands on both sides of conflagration. I'd been reading about D-Day on our summer travels, which likely explains why the term popped into my head yesterday as I listened to a radio news broadcast that delivered the news that Jack Layton had died. His D-Day had arrived. As the words transitioned into meaning, I took in a sharp breath, stunned with what I had just heard. Anyone who watched the press conference in late July instinctively knew that he was in trouble. His sunken cheeks and feeble voice clearly suggested that the outlook was grim. That said, Jack was a fighter, and if anyone would come back from the brink it would be him. Even in his final days he was thinking about his vision for Canada, and wrote a closing message that is generous, thoughtful and inspiring. 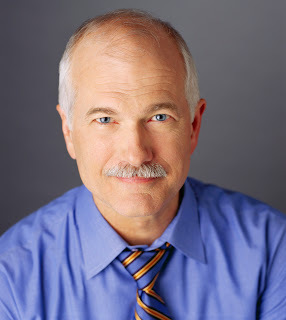 "Jack Layton died this morning," I said to Ben as he emerged from his bedroom, wiping the sleep from his eyes. He paused, processing the news, his face long, concerned, reflective. Another loss would come his way later that morning. 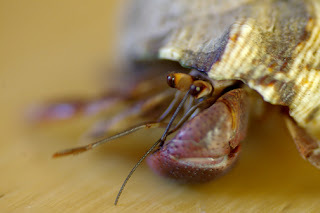 We had given Ben a pair of hermit crabs for Christmas, setting them up in our old fish aquarium in the living room, Outside of keeping the water dish moist and offering a few morsels of crab food, they are incredibly easy to look after. However, two weeks of being away proved to be too much for the smaller one, and Heather found it shriveled up in the corner. Another long face, more concern and reflection, Ben crafted a small box out of some special gold card stock we had in the study, wrapped up the crab in tissue paper and set it inside. He dug a small hole in the back alley next to the shop, put the box inside and covered it up. "Do you want to say a few words," asked Heather. "Not yet, I need a few more minutes," he replied. He ran to the front yard and came back with several flowers that he gently placed on top of the grave. "Not yet, I need to make a headstone." With some leftover cardboard, he made a grave marker and propped it up against the adjacent pile of wood. 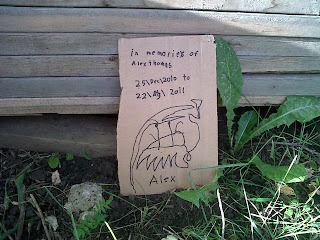 He had named his crab after my late grandfather, Alex Thomas, unbeknownst to either of us. We stood together, shoulder to shoulder and heart to heart, in wonderful silence and remembrance.